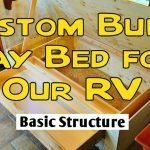 In a previous blog post, I detailed the construction of my custom RV daybed platform. It consists of mostly plywood held together with screws and pine lumber. These materials keep the box pretty light weight but leave me an unfinished plywood exterior to contend with. Painting it wasn’t going to look that great because of the rough plywood surface. I could add on some finished wood veneer paneling, but I don’t really have the skills or patience for that. 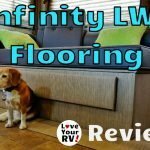 So, I decided since I was already replacing the slide outs carpeting with a product called Infinity “Luxury Woven Vinyl”, why not use it as a covering material for the daybed? In my mind, it would look pretty sweet! The Infinity LWV Bamboo #3 color ended up going fantastically well with the espresso color we chose for the mattress and cushions. And both colors blended well into our existing Keystone Cougar decor. Working with the Infinity product is very easy. A simple sharp edged utility knife will easily cut out the desired pattern. 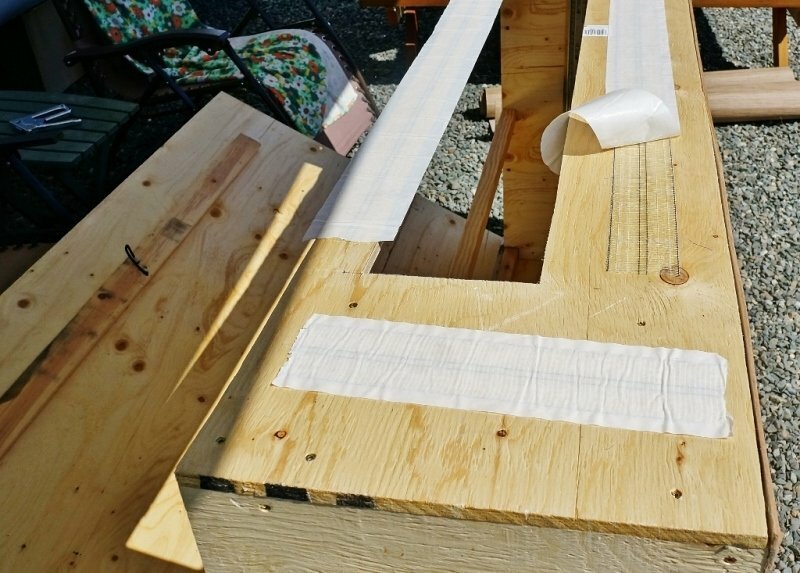 I decided to wrap the LWV around the corners of the plywood and staple it in place in a hidden location. 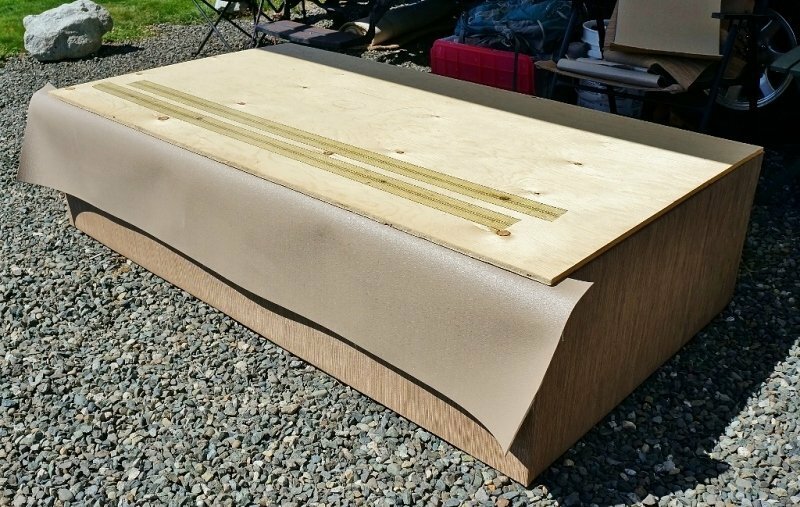 Wrapping it like that made for smooth corners on the daybed box and drawer face, giving it a very modern and clean look. To keep the LWV material affixed to the plywood, I also added strips of double sided carpet tape on the plywood’s flat areas. 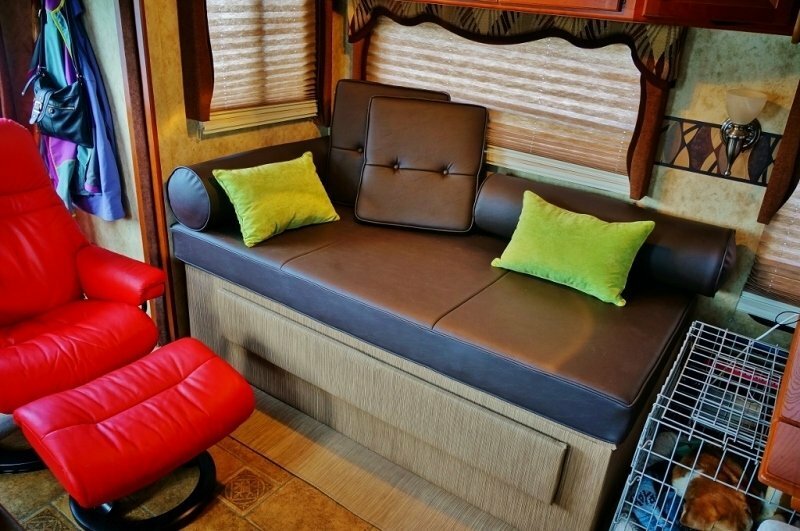 Because the RV daybed is located in a corner, it will only be seen from two sides. 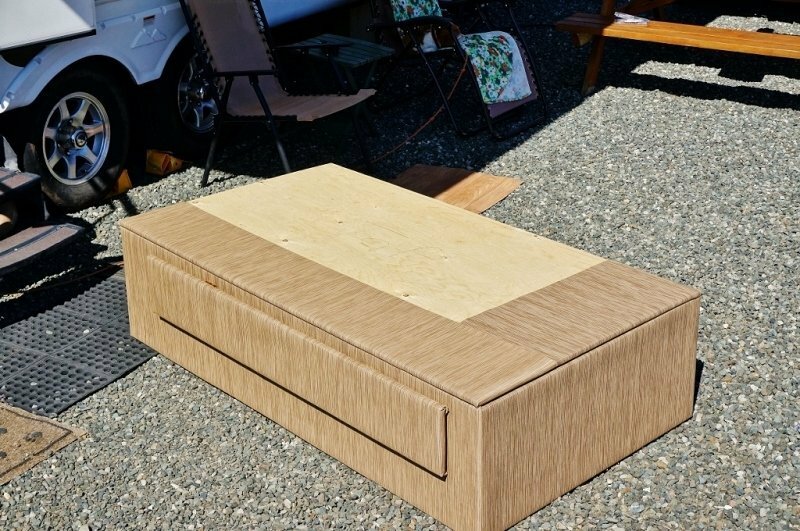 Rather than covering the whole box with Infinity LWV I only used it where a person’s eye might see and left the rest of the daybed platform unfinished. 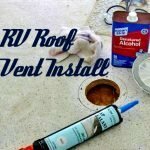 This will save me a nice chunk of the flooring roll for other planned uses in the RV. I’m not too concerned with making the inside storage area look all pretty right now, so will leave it as unfinished wood. Maybe in the future I may get motivated and paint it but really it’s more for long term storage items so not a big deal. 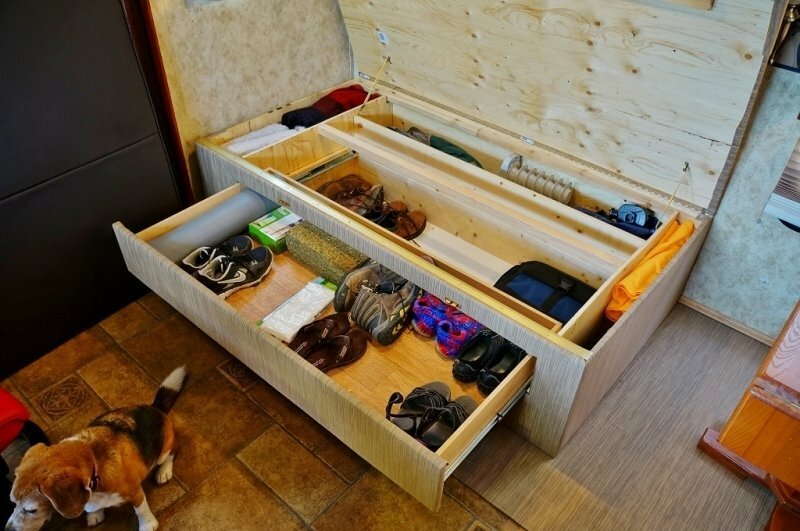 To finish it up I added a wood divider between the end of the drawer and the far rear storage bin. 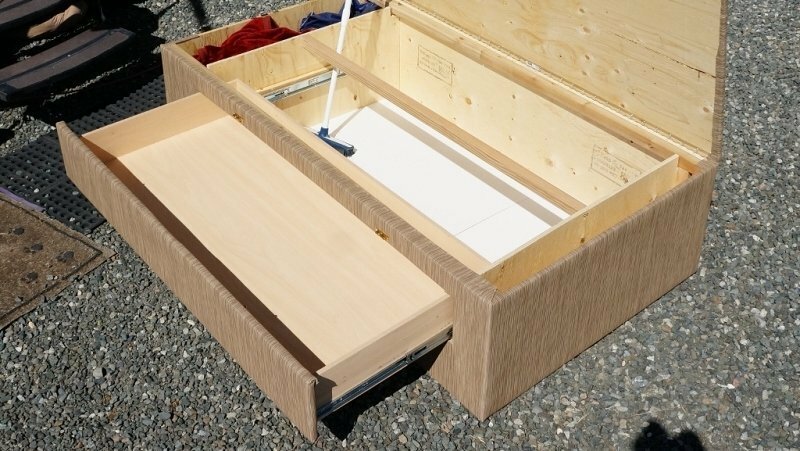 This will keep stuff back there from falling forward and interfering with the drawer operation. 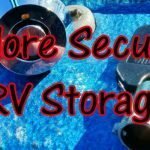 To keep the lid up while we are accessing the storage I’ve added a pair of cheap locking hinges. 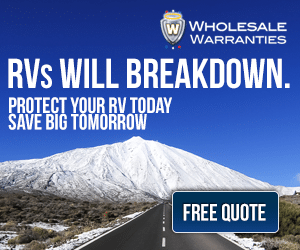 I had planned to use gas springs but sourcing them and getting them shipped to our current small town location in Canada is a bit of an issue. I will wait until we are in a more convenient local. One item that is way out of my DIY abilities is the mattress and cushions so we hired a nearby upholstery shop to custom build them for us. We initially wanted to get them covered with leather, but that became a no-go financially when we learned the pricing of materials. It would take two cow hides to cover our material needs and when added up with the foam and labor costs it was getting close to the $2200 USD mark! 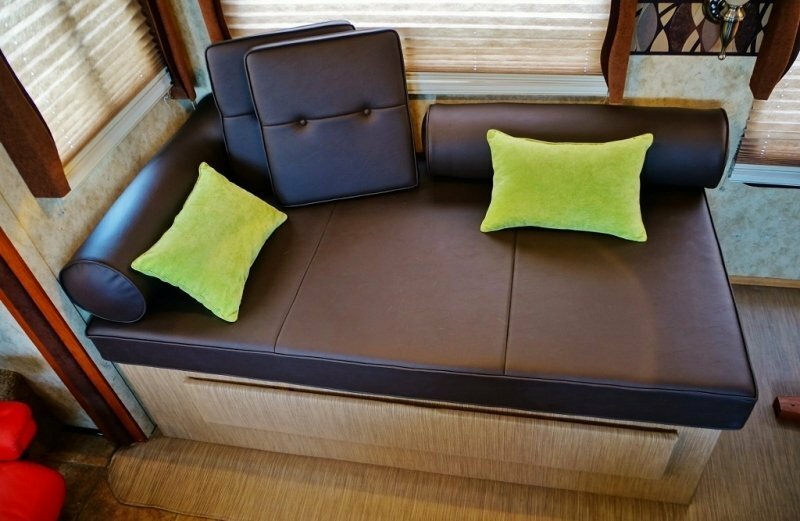 So we changed our plans and went with a very high-end vinyl material which brought our mattress and cushions total cost down to around $750 USD. They used a very dense thick foam inside with a lighter outer foam. This will help maintain long lasting support at the same time being comfortable. 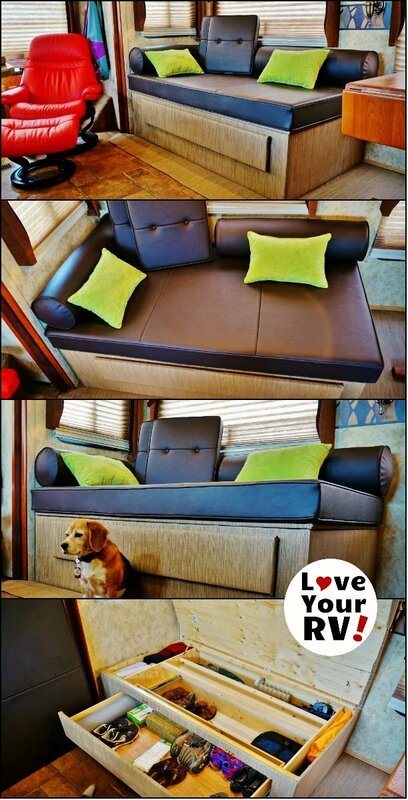 The upholsterer did a great job of stitching, adding a few extra seams and things to give the pieces some extra flair. I think the result is very stylish. 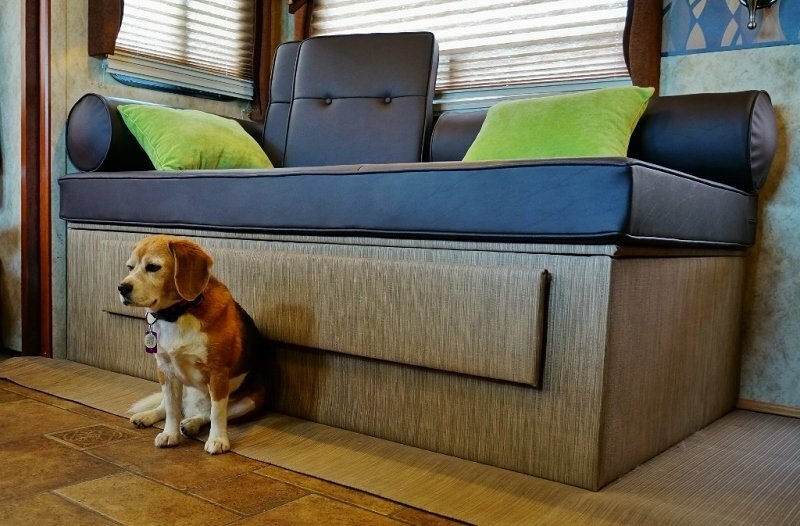 We are ecstatic with the look and functionality of our new custom RV daybed. 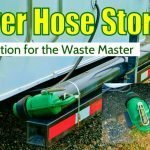 The total cost works out to around a thousand dollars, but it is made from very good quality materials and should last us a long time. 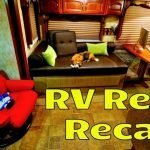 We had shopped around for so-called “RV furniture” and found it lacking in style and quality but still pretty expensive. 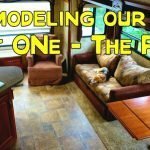 As far as regular furniture goes it was hard to find items the right size for an RV or that would fit through the narrow entrance doorway. 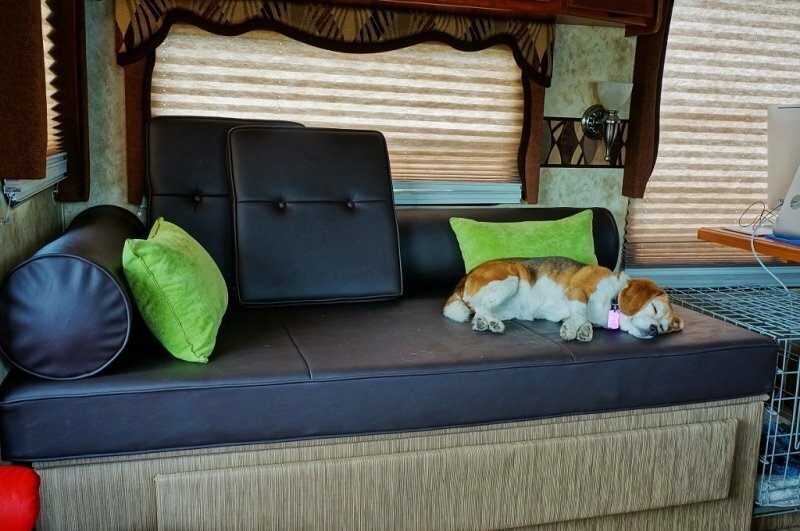 I think the DIY daybed was a great way to upgrade from that lumpy, tired looking OEM RV sofa. 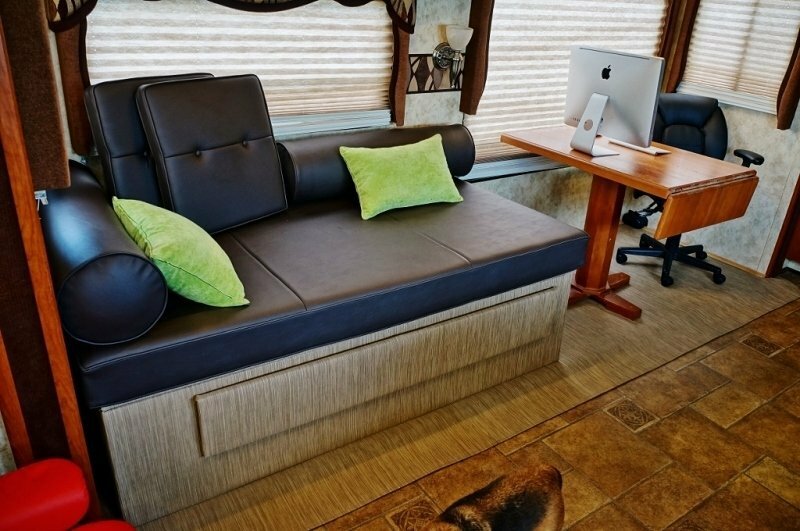 With the durable vinyl materials I used to cover the daybed cleaning and maintenance will be a breeze compared to the old fabric type RV sofa. Rather than Angie’s beagle hair sticking in the sofa, they can now be easily wiped off and swept up. Also, stains and odors will be a thing of the past. 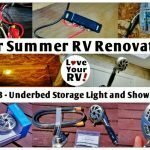 You can look forward to one more post in this Summer RV Renovations series. I still have a little bit of work on the flooring in the bedroom area and will give a full recap of all the upgrades.